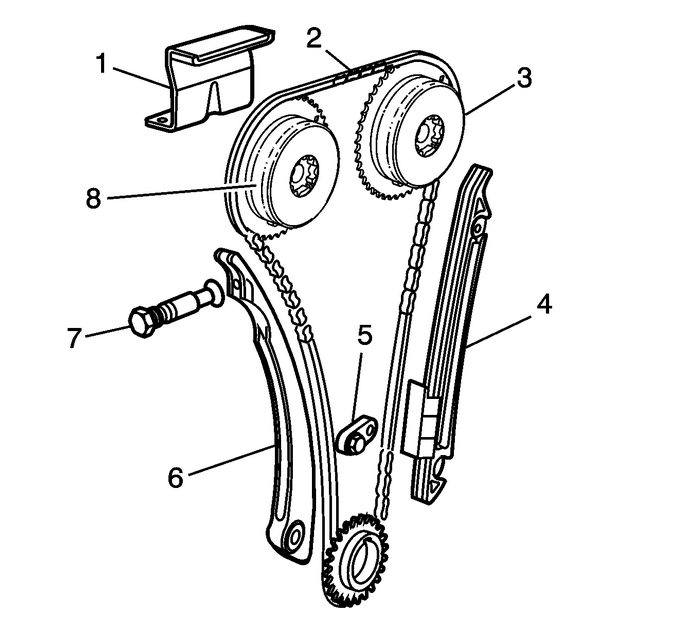 Inspect the timing chain guides-(1, 4, 6) forcracking or wear.Replace the timing chain guides if wear exceeds1.12-mm (0.045-in) depth on the chain guidesurface.Inspect the timing chain tensioner shoe for wear.Replace the timing chain tensioner shoe if wear exceeds1.12-mm (0.045-in) depth on the chain guidesurface.Inspect the timing chain-(2) andactuators-(3, 8) for wear.Inspect the camshaft actuator faces for signs ofmovement.Inspect the camshaft actuator teeth and chain for signs ofexcessive wear, chipping, or seizure of the timing chainlinks.Inspect the oil nozzle body-(5) for collapse orcracks at the bolt boss. Discard and replace the oil nozzle body ifit is damaged.Verify oil nozzle oil flow with compressed air.Inspect the timing chain tensioner-(7) for thescoring or free movement.Inspect the timing chain tensioner washer andO-ring for damage. If damaged, replace the timing chaintensioner.